There is really no other way to explain Larry Graham’s place in the evolution of bass guitar. Simply put, there’s bass before Larry Graham, and there’s bass after Larry Graham. It can be assumed that most bass players begin their journey in the bottom-end business at more or less the same starting point: using two hands and a bass. Larry’s story has a slightly different origin, or more specifically, different limbs and a different bass instrument. As a musically talented teenager who could play multiple instruments, Larry favored the electric guitar, and by age 15 was gigging around town with his mother’s band, The Dell Graham Trio. Yet even as a budding teenage guitarist, Larry understood the need for bass frequencies in a band. The trio, which consisted only of guitar, piano and drums, didn’t have a bassist, so the innovative younger Graham learned to accompany himself on bass pedals with his feet after discovering a house organ in one of the group’s regular nightclub venues. Eventually the organ broke down however, and when their drummer left the group and reduced the Dell Graham Trio to a mom and son guitar and piano duo, it was as if the stars aligned in the shape of a thumb and forefinger and forever changed the course of modern bass guitar. With a single St. George model electric bass that young Larry rented from a local music store, he not only found a way to replace the bottom end lost with the broken organ, but ingeniously compensated for the missing drummer by emulating a kick drum sound with his thumb “thumping” the bass guitar’s low string, while copping the snap of the snare with his second finger “plucking” the higher strings. The teenage Larry Graham was merely following his ears; bass guitarists ever since have been following Larry Graham and his unique approach to playing a bass guitar. In a few short years, Larry found himself as the bassist in one of the sixties’ most innovative bands, Sly & The Family Stone. The band, who would go on to sell millions of albums and release hit after hit, became the benchmark for all who would toil in the funk and R&B roots planted by Sly, Larry and company. While the group would eventually dissolve from infighting– no doubt fueled in large part by the requisite drug use and abuse that swallowed up many a musician and band of that era– Larry Graham never lost his footing. Leaving Sly in 1972, Larry formed his own ensemble, named it Graham Central Station, and went on to establish his own place in funk’s Seventies heyday alongside heavyweight acts like Earth, Wind & Fire and Kool & the Gang. When the Eighties rolled around, Larry climbed yet another rung of his one-way ladder up, when his solo ballad “One In A Million You”– which featured Graham’s distinctive baritone lead vocal– rocketed to the top of the charts. Twenty-five years after hitting pay dirt as a member of Sly & The Family Stone, the whole world suddenly knew the name Larry Graham. Interestingly enough (to me, anyway) my path crossed with Larry’s in the aftermath of “One In A Million You'” and several successful follow ups he recorded. Graham came to New York’s Duplex Sound in 1985 to record his solo album Fired Up with producer Eumir Deodato, a then-hot producer who had just come off a string of hits with Kool & the Gang. At the time, I was a young songwriter and musician working at Duplex and had the opportunity to contribute to Larry’s album. Even more memorable than my studio work on Fired Up was meeting Larry for the first time. When I shook his hand, his giant right hand nearly swallowed mine whole. Clearly, I thought, this man was born to play the bass. It was an honor for me to talk to the Graham Master for this interview and listen to him reflect on a fascinating career. Although he’s a bass icon and member of the Rock & Roll Hall Of Fame, in conversation he’s as down to earth and affable as your friendly next door neighbor, with thoughtful, insightful answers and many a laugh, At age 64, Larry’s career shows no signs of slowing down either, and you can bet there’s gonna be a whole lot more thumpin’ and pluckin’ from the man who started it all in the first place. Let there be no doubt: Larry Graham is the Godfather of Funk Bass. Let’s start with some of the recent things you’ve been busy with, such as the Billboard Live event in Japan. You played there with Graham Central Station, as well as several nights with Marcus Miller. What is Billboard Live? It’s a really nice venue. The one in Tokyo has a main floor and a balcony, and then a third balcony which is much smaller. So it’s kind of three levels, and a nice size stage. It’s inside of a really nice mall and up a few floors, and at the end of the show, maybe like for the encore, they open up the curtain and there’s a fantastic view that is a backdrop behind the band. Yeah, it’s really nice. We did eight shows there and I did six with Marcus. You were playing with Marcus’ band? It was his band, and then I was a special guest on his show. Oh, it was great. I mean his band, they all know my stuff really well, and they’re all a bunch of nice people. And Marcus is just a wonderful human being, and so we got along great. I feel like I’ve known him for years, though this was actually the first time we got a chance to really hang out and play together. What was it like playing bass with Marcus? Well he’s been into my music for eons, so we were very compatible because he knows my music so well. He knows my bass lines, so we didn’t clash. It’s like, you know how you’ve seen some bands with two drummers? It’s rare that you see that and it usually doesn’t work out too well because there are very few drummers that can play together. But when it works it’s very powerful. Well, it’s a similar thing with bass players. Rarely do you see two bass players that can play together at the same time on the same song. But because Marcus is so aware of my music, and has been for a long time, we didn’t bump heads. And what was great was that we weren’t up there competing with one another, we were up there playing together, so that made it a great show. The same thing was true with Stanley Clarke when we played together. An advantage that Stanley and I had was that he was playing the piccolo bass, it’s a little bit more of a challenge with two bass players that are both playing standard 4-strings. There must have been a lot of funk up on that stage with Marcus. Yeah, there was! The people just went off. Speaking of Marcus and Stanley, who are both world-renowned bassists with their own recognizable sound: they’ve built part of their sound on what you invented in the first place, the slap bass technique– which you call ‘thump and pluck’. What’s it like for you now, when you see bass players who have taken this technique you originated, and made their own thing out of it? Is it gratifying to you? For me, I grew up at a time when if an artist covered somebody’s tune, that was really paying them one of the highest compliments. You know, if somebody came out with a song and you did a cover of it, like Aretha Franklin did with Dionne Warwick’s songs, or the Otis Redding song, she was really paying them a high compliment. So for somebody to really study my music so deeply that I become a part of them, and their learning process, that’s like one of the highest compliments that they could give me. They could tell me, “oh you know, I like your style of playing the bass”– that’s one thing and I appreciate that. But to take the time and energy and a big chunk out of your life to learn how to play like me, regardless of what else you do with it, you know, to take that portion of your life– since life and time is so precious, things you can’t really buy– you’re going to devote that to trying to do what I do? That’s like whoa, that’s one of the highest forms of compliments. Do you feel like you’ve gotten the recognition you deserve for inventing that technique? Recognition really hasn’t been something that I’ve been looking for all of my life. My gratification comes from doing what I do. And the thing of it is, it was given to me anyway, you know? I never planned to be a bass player. It was a gift given to me, so what better thing could I do with it than to share it with others who were willing to share it with their crowd? Most of those bass players that use my style of playing as a foundation have their own audience, and collectively, if you put all those bass players that thump and pluck together, and all their audiences together, maybe they’re reaching tons of folks that would never even hear my style of playing the bass if it weren’t for them. Their audiences know that particular artist’s music, but they might not even know me. 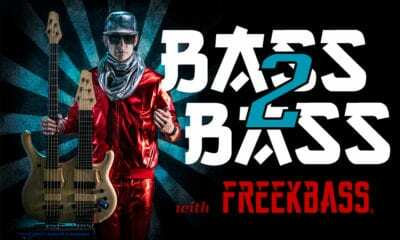 You came out with your own instructional video a few years back titled “Funk Bass Attack”. How was yours different that the others? What was different about it was that I was totally doing me, because my bass playing is not built on any other foundation other than my mother’s left hand, that was the foundation I had for bass. I didn’t really have any pattern to follow or anything to go by, I learned by just going from the heart and out of necessity. So when I did my instructional video, you’re just seeing and hearing in raw form what I did from the beginning. It’s not really built on top of anything. For bass players trying to learn your style, what’s the fastest way for them to get up to speed? Are there any short cuts? Well for one thing, I would highly recommend the bass video you just mentioned. I would recommend any access they have to seeing any videos, whether it’s on the Internet or whatever, anything visual they can get their hands on. They could check me out thoroughly that way, or any of the bass players that play like me, pick one of those guys and study them, study what they’re doing. The foundation is the same, but maybe the music that they’re doing with that style of bass playing appeals a little more. The bass foundation is still the same, so I would say study that, and it’s still gonna take you in the same direction. You started as a guitarist, so once you became a bass player did you come to appreciate other bassists, and did they influence you? By the time I got to Sly & The Family Stone, I realized that this is really it, I’m really stuck in this mode here. It really sunk in that playing bass was why I was IN the group. I mean, I always had hopes in the back of my brain that this is temporary with the bass! Not that I didn’t like the bass, but I liked the guitar more. But by the time I got to Sly & The Family Stone I was really locked in that position. And then after some time passed and we did songs like “Dance To The Music” and “Thank You (Falletinme Be Mice Elf Agin)”, I started hearing other bass players copying my style, because of the popularity of the songs. It’s hard to play “Thank You” without thumpin’ and pluckin’! So when I started hearing other bass players doing it, I really knew I was locked, and there was no need to listen to other bass players in terms of copying or imitating them, or taking some patterns from them. I was already locked into my own thing. Speaking of Sly & The Family Stone, in your opinion what made the band so original and so groundbreaking? There were a number of factors. First, you had the music, which speaks for itself, but also Sly was a genius of a writer. You also had a group that was racially mixed, male and female, and self-contained. Back then you had a lot of singing groups that were out front, with bands in the back, but we were self-contained. We were the band and the singing group. So you put all those factors together, and also the fact that I think it was genius on Sly’s part to allow each member of the band to be themselves, as opposed to trying to make them play however he wanted to play. He asked me to be in the band because of what he heard. He heard me doing this different way of playing the bass, so if he had tried to change me up to play like him — because he’s a bass player too — then that would have made a difference. Nobody played guitar like Freddie Stone, and even though Sly played guitar, he let Freddie be himself. If he had tried to change Freddie up that also would have changed things. Sly could play drums but he didn’t try and make Greg Errico play like him, he let Greg be Greg. You heard Greg playing beats like “Dance To The Music” and stuff like that, nobody was playing beats like that, you know? So Sly letting everybody be themselves, add that to all the other factors, and I think that that’s what made the band successful. Last year the entire Sly & The Family Stone set from Woodstock set was finally released on CD. I know it’s been 40 years, and it was a wild weekend, but what’s most memorable for you about playing at Woodstock? Yeah, that kind of raised the bar a little bit. Raised the bar. So now he’s gotta do that again. And with us, after Woodstock it was like okay, we gotta hit that level again. And so that was a turning point for us, as far as live performances were concerned. That really took US higher! I know you probably get asked this all the time, but are you in touch with Sly? Any talk of ever doing anything musically again? I haven’t been in touch with him, no. I’ve been of course with Jerry & Cynthia, they both toured with me for awhile, and Rose too. (Author’s note: Jerry Martini, Cynthia Robinson and Rose Stone were original members of the Family Stone). And some of the places we played, like the Bay area, Greg Errico came and sat in, so we’ve had as many as five of us on the stage together at one time. Yeah, in fact the Sinbad tour in Aruba, which was four of us up there, is documented. That was really cool, four Family Stones on that. Let’s jump back to what you’re doing these days. Do you still have a busy touring schedule with Graham Central Station? Yeah, we just did the Japan tour you mentioned, and before that we did the International Jazz Festival in Istanbul, Turkey. We had never played there before, so that was really cool. We did two nights there and then we went over and played Arras in France, and Werchter in Belgium, both with Prince. Those were both outdoor festivals, and we did a whole bunch of other stuff over there in Europe which was really, really cool. It’s been a lot of fun this whole tour, so we looking forward to doing some more. What’s it like playing with Prince? Well, he also knows my music backwards and forwards. Prince knows my music not only as a bass player, but totally, so anytime that we work together it’s just a natural, you know, it’s a joy. We always have fun. In fact, on those two festivals I mentioned, after my show I ended going back out on his show and jamming with them. So that’s always really cool. You’re still playing the Moon bass. Why that bass? I’ve been playing it now, let’s see, about 27 years, so it’s like my third arm. Plus, back then what was beautiful was that they allowed me to have input into the bass, so it was a combination of things that they already had and were doing, and what I was looking for in a bass, the things that I wanted. That’s what I got, and that’s why I’ve stuck with it all these years. It’s in the feel, not so much something you can say, you have to feel it actually. So I tested out a bunch of their instruments, and verbally I did express some things to them of course; I like this about that bass, I like that about this bass, and could we do this and do that. And of course the color choice was important too, my first solid body electric guitar was white and gold so of course my bass has to be white and gold! What are your strings of choice? I like the GHS Boomers. I like the sound of those, I like the feel and flexibility and the snap of those strings, that’s why I’ve been playing those for eons. You’ve been in the music business an amazing 40-plus years. What advice can you offer musicians who hope to have any kind of longevity in this business? Well, for one thing, you’ve got to keep yourself healthy. Spiritually, physically and in every aspect of life actually, keep your mind clean. I think if a person is really serious about music they’re going to try to be good at their craft– and your readers are already doing that– but there are so many young people who are not learning how to actually play their instruments, they would rather use machines to do stuff. I have nothing against that, but I notice at our shows now, a lot of adults are bringing their children to the concerts. They’re kind of saying to them, “see, this is the stuff that was our music, this is real music being played by real musicians”. And so they’re trying to encourage them, and I’m trying to encourage kids to learn how to play too. But for those who are already playing, you’re going to get out of it what you put into it. If you’re going to put some hard work into it, that’s going to be to your benefit. And a lot of guys that are playing like me, obviously they’ve put a lot of hard work into it, because often learning somebody else’s technique is harder than what’s going to come out of you naturally. You are one of Jehovah’s Witnesses, it’s a big part of your life. Oh yeah, the biggest part. Is your religious life separate from your musical life, does one influence the other, or is it all one? It’s all one, I wake up the same way I go to bed. It’s just all one life, you know. My spiritual life, my music life, my family life, nothing is separated. It’s just one long journey. Yeah, one long big beautiful journey, all one thing. You gotta keep it on the one! In what ways has Larry, as well as Sly & The Family Stone, influenced you as a bassist and musician? Sly, along with Larry and the band, revolutionized music. They were combining funk, blues, gospel, rock, everything. And it sounded very natural. They also had black and white musicians playing together, which was new for that time. And Larry revolutionized bass playing. When I was coming up, you couldn’t get a gig if you couldn’t thump and pluck like Graham. But it wasn’t just his technique; the spirit that he approaches music with is incredible. The way he thumps octaves is sick. Everything has attitude and inflections, like a blues guitarist on bass. I think he started on guitar so that may have something to do with it. Are there specific techniques that Larry uses in his slap playing, or thump & pluck as he calls it, that differ from yours? Nah, not really. His hand looks a little more up and down than mine, which is kinda sideways, parallel to the strings. But otherwise, it’s straight thumpin’ and pluckin’! He does use his third finger down low more than I do because his fingers are long. I use a more acoustic bass technique down low (first four frets) using the third and fourth fingers together. What was the experience like for you playing onstage with Larry at Billboard Live? It was sweet. This was my first time really hanging with him but it feels like I’ve known him for 35 years, probably because I studied his music so much. And his personality is exactly like his music: warm, crazy, energetic, and fonky!